Bertie John Doy was born in Gateley on 5th September 1895. His parents were Charlotte Doy and Alfred Christmas Doy. His father came from Gateley and Charlotte née Dawson was born in Brisley. Bertie attended Brisley School from 9th November 1904 until 20th December 1907. He had previously attended school in Gt. Ryburgh as according to the 1901 Census, his father was employed on the farm at Testerton and they were living at No 3 the “New Cottages”. On leaving school, he worked on local farms with dairy cattle and on his enlistment papers he was described as a Team man. 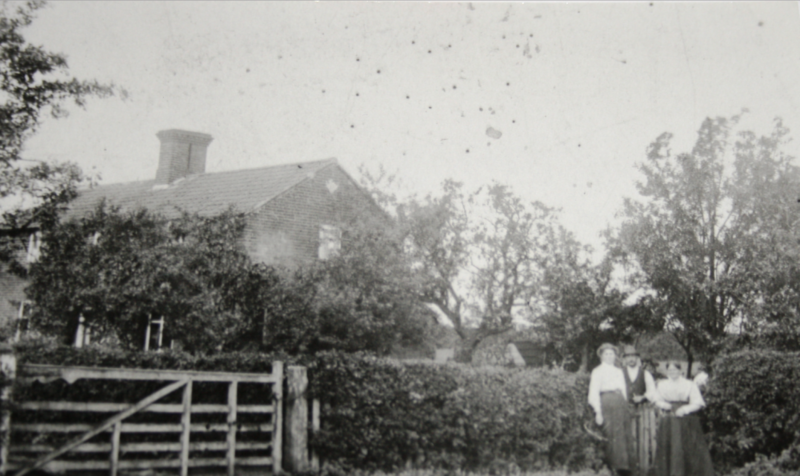 In 1911 he was working on the farm of Mr & Mrs Charles Green in Brisley. Ethel & Mathew Howling with Ellen Howling (nee Hunt) Outside Green Farm Brisley where Bertie worked. 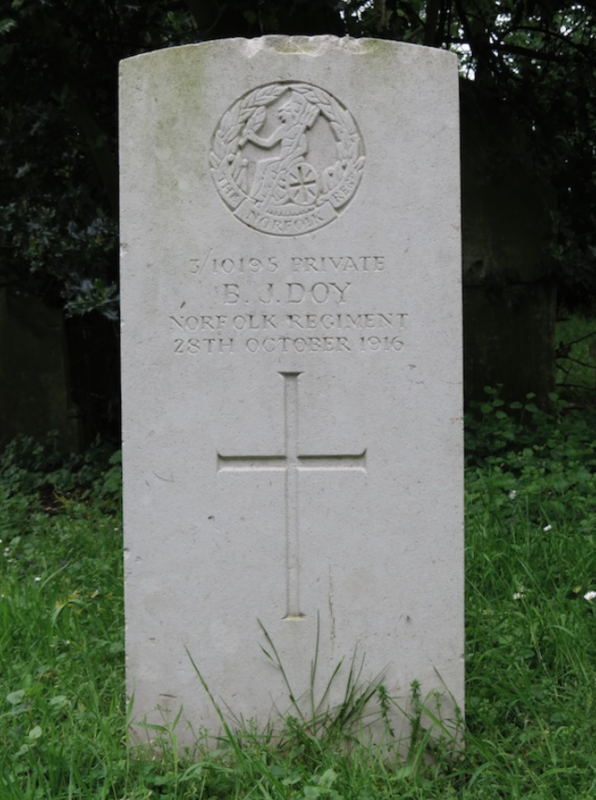 Nineteen year old Bertie John Doy joined up with the 7th Battalion Norfolk Regiment, on 7th September 1914. On enlistment he was measured as 5ft 6in tall, weight 136 lbs with blue eyes and brown hair. 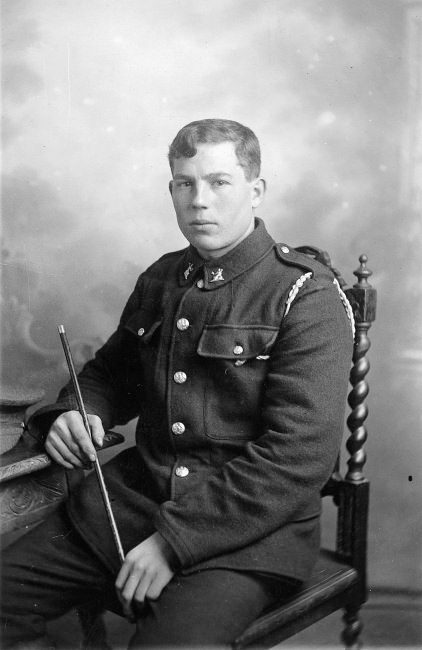 He began his home service and training immediately, for 357 days before being sent to join the British Expeditionary Force in France on 30th August 1915. He remained there until 3rd May 1916, though not entirely uneventfully. On 23rd October 1916 he was sent back “to England” on board “H. S. Western Australia” for further medical treatment at the Lord Derby War Hospital at Warrington. South West corner of St. Bartholomew’s Churchyard, Brisley. At his death, his mother was still a widow having brought up her eight children single-handedly after husband, Alfred Christmas died. 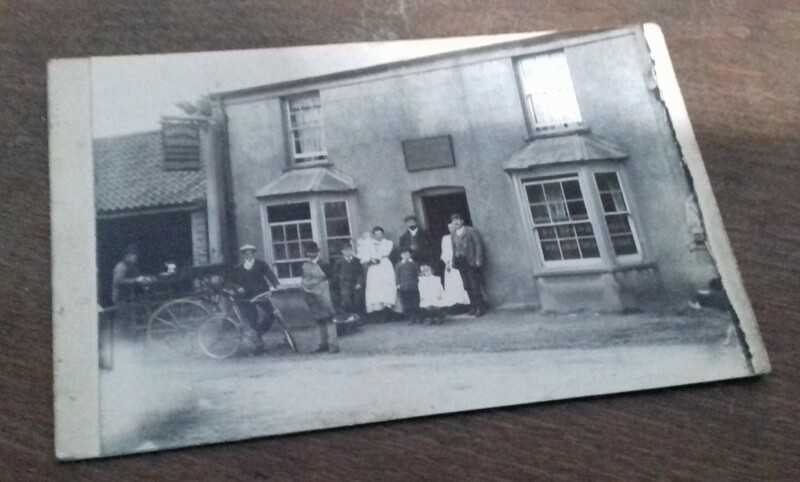 Documents in the Service Record after 1918 now address Charlotte as Mrs. Hall, living at The Marine Tavern, Gt. Ryburgh. Army Form W5080 verified by Revd. F.H.Tatham in 1919 lists Bertie’s seven siblings who were then aged from 11 years to 26 years. 3 siblings were living in Gt. Ryburgh. Brother, Herbert, was on active service. The two girls would appear to be in service or at least in the care of families in Colkirk. Bertie's 3 medals were issued to his mother in 1920. It is fortunate that we know from the available War Diaries the location where he suffered his fatal wound. It was certainly with the 35th Infantry Brigade in the Arras region. If he was still attached to the 7th Suffolks or back with the 7th Norfolks the location was the same, as the Norfolks were to relieve the Suffolks on the night of Oct. 13/14. The 7th Suffolks had been at the front line in ”BULLS RUN near FLERS” since the 10th October when they in turn had relieved the 11th Middlesex Regt. Frustratingly, there is no entry in the diary between 11th and 14th October!